It doesn’t feel right to like Rick Astley. As a girl that has grown up mercilessly rickrolling her friends, it feels just wrong to look at him with anything other than contempt. In preparation for the concert I decided to listen to Rick’s new album, and about 15 seconds into the album’s namesake, ‘Beautiful Life’, I stopped in my steps and whispered “oh no… It’s groovy”. Rick stands at the front and centre of the stage, “this song is for those dragged here tonight, I’m sorry” he says sympathetically, taking a sip from a metallic mug of what I can only assume is tea. 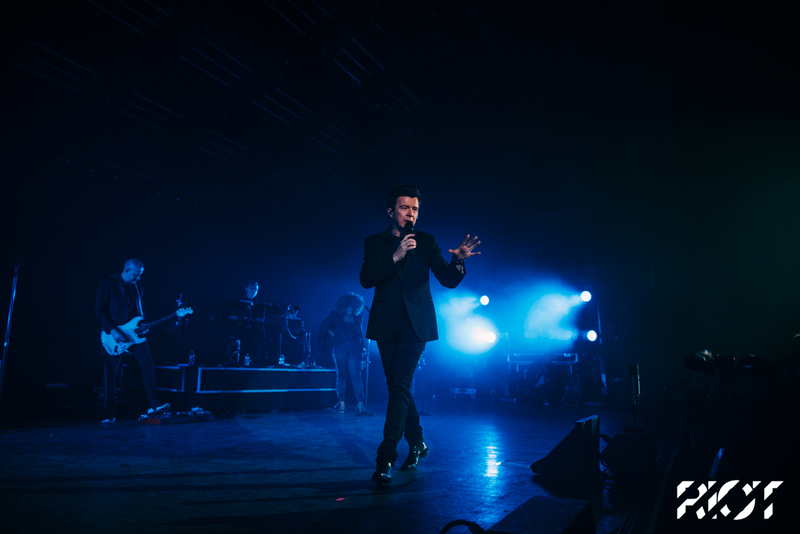 He then moves into a bit where he imitates the husbands in the crowd, standing – arms crossed – pretending to hate every moment of the evening, being completely self-aware of where he stands in the music industry. It seems like he knows what his crowd wants, collecting his acoustic guitar at the side of the stage and then mentioning into the microphone that it was a “cue for [the crowd] to sit down”, saying “we are all getting the age” where standing up for a whole concert is less viable than in the past. Rick has timed his set list so that the crowd had intervals to sit down, a huge contrast to the usual approach people take of having a build up and a calm moment in the late middle of the set. He knows what he is doing, and somehow I feel a little sorry for him. 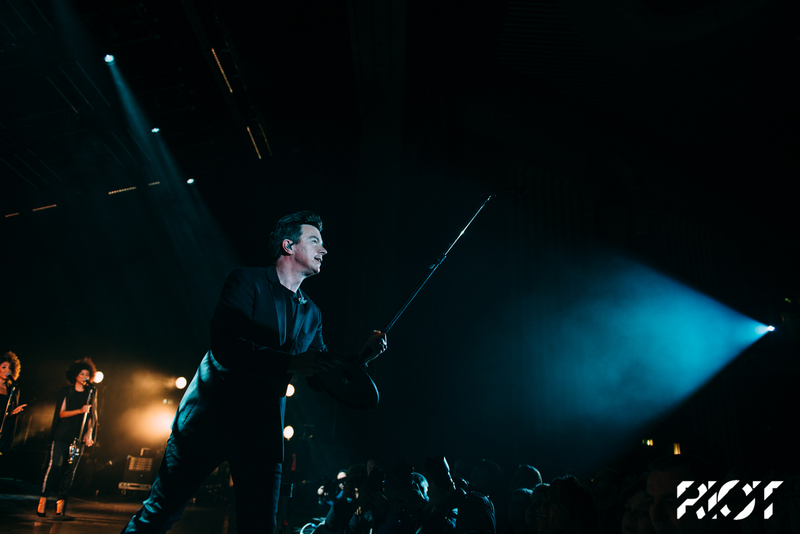 The fact that of the crowd is waiting for his massive hit, ‘Never Gonna Give You Up’, doesn’t seem to escape him, and knows that everything before that better be a brilliant show, or people are going to get upset. Next, a familiar drum fill starts a song, and as the guitar comes in Rick calls out “hands up if you thought it was Never Gonna Give You Up” and the crowd screams. For someone with a voice that absolutely stands the test of time, hitting every note over 30 years after his first release, that was kind of depressing. 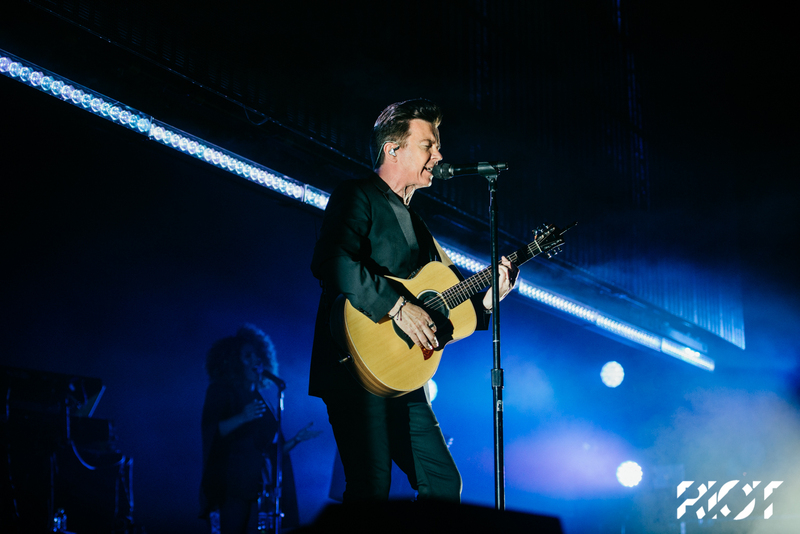 Rick Astley positions the concert as more of a show, interspersing funny bits and covers from bands such as Daft Punk, Chic, Queen and even covering ‘You Can Call Me Al’, mixed in with George Ezra’s ‘Shotgun’. I never thought I would get to hear the bass fill from You Can Call Me Al but I can assure you, my dreams came true. He was absolutely aware of the “20 feet from stardom” struggle within his backing musicians, giving each of them their own moment to shine and take over the show. The only thing that slightly perplexed me was the audience’s reaction to the show. In my opinion, the whole show captivated me from start to finish, being one of my favourite gigs of the year, which is honestly a bizarre thing to say. The concert wasn’t just a gig, it was a stage show. But Rick wheels out a gong for one of his songs and a crowd member yells “everybody was kung foo fighting!” Rick stops in his step and looks over at the culprit, who leans forward and hands up a neatly presented gift bag. At gigs I am used to, the audience yells “I love you” and throws their gift onto the stage at the singer. Maybe it is just my age… But everything felt a bit dystopian. To bring a brilliant night to an end I managed a feat that would send 14-year-old me into a hysterical fit. I had a chat with Rick Astley. I told him that it’s a shame that my generation only view him for his most popular song (and meme him for it) because, honestly, he has some decent bangers.